New Paradigms For Collaboration & Knowledge Sharing – Collabor8now! I was recently asked to present at an Institute For Employment Studies event for corporate HR and Heads of Learning & Development. The slides I used are embedded at the end of this bog, and also available at Slideshare and Authorstream. The title of the event was “Getting maximum business value from your L&D activity”, which, for me, opened up an opportunity to discuss and describe what I see as the unprecedented opportunities and potential available through the Internet and the Social Web for learning and personal development (also referred to as “Personal Knowledge Management”). The world of social interaction, fuelled by the plethora of social media tools, has opened up new opportunities to learn and share. 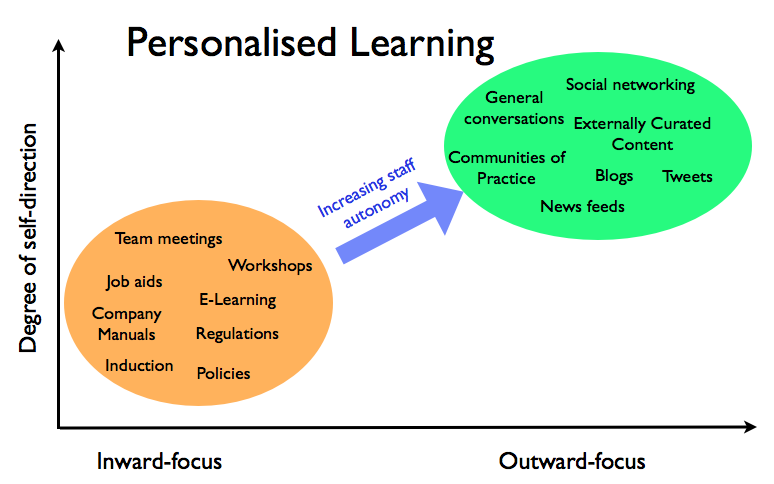 Classroom training is no longer an essential part of learning and development. We can now tap into the collective wisdom of peers and experts as and when we need. Skilling ourselves for a challenging and volatile environment is a personal responsibility – we can’t rely on others, including the people and organisations we work for. Sadly, for some, this is not as easy as it sounds. Workplace restrictions on what staff can see and do on the Internet are controlled and regulated by policies – and people – that have changed little since the 20th Century. If you have a HR or L&D manager who has never blogged, does not use LinkedIn and refuses to engage with social media, it’s unlikely they will advocate the use of these facilities in the workplace, and consequently no business case will be made to provide access to social networks or social media tools. Consequently, more and more people find they need to use their smartphones in the workplace (unless these have also been banned) or revert to out-of-hours working to do the things they could and should have done at work. This leads to some crazy anomalies, which really ought to be challenged more vigorously, such as the many public sector departments who use YouTube to promote their services but ban their own staff from accessing this medium. Or the NHS Trusts that prevent their staff from accessing networks such as Patient Opinion, and consequently don’t know what is being said about their hospital services and therefore unable to challenge or respond to complaints. So, coming back to the main thrust of my presentation – that it is a personal responsibility to attain the necessary education and skills to survive and thrive in an increasingly unpredictable economy. Staff can’t (and shouldn’t) rely on the prescriptive nature of their company’s core training curriculum, which is more likely to be inward-focussed and heavily weighted toward policies, strategy and compliance rather than vocational training – unless of course you are fortunate enough to work for that rare breed of organisation that funds apprenticeship schemes. It is foolish to plan an entire career on the assumption that you’ll be working for the same organisation. Transferable skills should be the primary goal – which may not be the first priority for organisations that want to retain staff! Specialism is all very well provided it’s not dependent on one specific industry or organisation. See wheeltappers for lessons learnt!